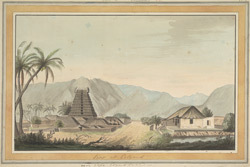 This drawing depicts a temple 'gopura' and complex, probably of the Satyavageeswarar Temple at Kalakkad near Tirunelveli, in the southern part of Tamil Nadu. The 'gopura' is the entrance gateway to the enclosure of a Hindu temple, a typical feature of temple architecture of Tamil Nadu. From the middle of the twelfth century onwards the gopura was an increasingly emphasised architectural feature of Hindu temples. They are extremely tall pyramidal structures elaborately decorated with sculptures and capped by a barrel vault. The base is of stone while the superstructure is of brick and plaster. Some gopuras in Tamil Nadu still retain the brightly coloured paint that originally covered the surfaces of these monumental structures.